The Secretarybird of sub-Saharan Africa looks like a slim eagle set on the long, slender legs of a crane. Secretarybirds can fly but prefer to hunt on foot, walking over 20 miles a day and dispatching their prey with powerful kicks of their taloned feet. Meet the Secretarybird, a bird of prey like no other on earth. Picture if you can a slim eagle, striding through the grasslands of sub-Saharan Africa on tall, slender legs like those of a crane. Standing four feet tall, the Secretarybird is beautiful: feathered in silver, set off by black wings and leggings. The face is half covered in bright red skin. Beyond the black tail extend two long white plumes tipped in black. And from the back of the head dangles a spray of long black feathers. Utterly fantastic in appearance, these specialized raptors are also serious carnivores. 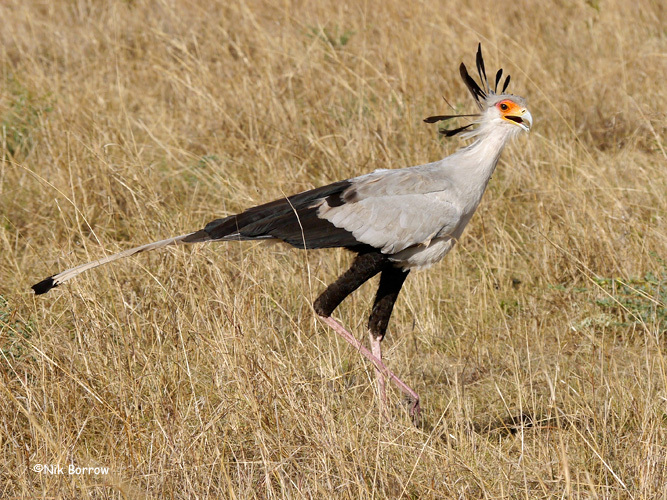 Secretarybirds track down their prey not on the wing but on foot, often walking more than 20 miles a day. They hunt rodents, snakes, insects, lizards, and other animals, dispatching them by stamping repeatedly with rapid, powerful kicks of their talons. "Secretary" in the bird's name might follow from its black head quills, reminiscent of 19th century human secretaries with black quill pens. But more probably, "secretary" derives from the Arabic word for "hunter bird." Bird sounds provided by the Xeno-canto Foundation. Feature sound XC391856 Secretary Bird recorded by Niall Perrins. Background sound XC280188 Harlequin Quail recorded by P Boesman. jackal vs secretary bird face off.